This year, Dr. Samuel McLean was awarded a $21 million grant from the NIH to perform the AURORA Study, a first-in-kind study evaluating the development of chronic pain and other adverse neurologic and mental health disorders after trauma. The research department consists of 20 full time faculty and staff, including an epidemiologist to assist resident and faculty scholarly projects. Each year our department hosts a Resident Research Symposium where our CA-2 residents present the results of a Quality Improvement project completed during the year. Many of these projects are subsequently presented as posters at national meetings or accepted as abstracts for publication. 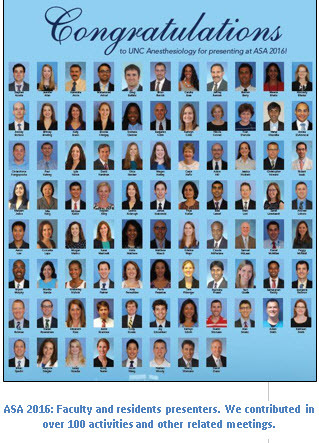 Our residents have presented at multiple local and national meetings including North Carolina Society of Anesthesiologists, Pain Society of the Carolinas, American Society of Anesthesiologists, Society of Cardiovascular Anesthesiologists, Society of Obstetric Anesthesia and Perinatology, Society for Ambulatory Anesthesia, and many more.